Attributes of the Five Animals: Snake. With contour, and silent power, the snake slithers towards his target. He waits, coiled, energy stored, and ready to spring. He watches his prey. In an instant, the serpent uncoils to action -- his body wraps the victim, immobilizing any hope for retreat. In the words of Sun Tzu: "Energy may be likened to the bending of the cross bow. Decision to the releasing of the trigger." Ch'i. Ch'i is internal energy. This life force flows through our body and is nourished by correct breathing, exercise, and nutrition. The baby who holds onto the rattle with incredible strength demonstrates the power of ch'i. The snake, as he rests upon the warmth of the rocks, builds his energy, but at an instant can uncoil and bring this power to a focus. The realization of moving with ch'i is the result of relaxed, properly structured physical movement free from the confines of conscious thought. The snake is unique in being both a defensive and offensive animal. When confronted with the speed and flurry of the leopard, the snake assumes the defensive role. When seeking conflict with the crane, the snake assumes an offensive position. Focus. The snake can concentrate his energy into one fine point and create devastation to that vital area of the body. Also, the snake can dissipate and spread his focus over a broad area as he seeks to constrict and hold. Faith. The snake possesses faith in himself -- personal confidence. The snake possesses faith in others -- trust. There are two distinct types of snakes -- constrictors and vipers. The constrictor utilizes his strong, contoured body to immobilize his prey, crushing their bones, and sealing off the breath of life. This constrictor is tremendously skilled in grappling and can hold, lock, dislocate, and choke his victim. The viper snake relies upon his venom and sharp fangs to inject the victim -- striking the pressure points, nerve centers, and vital areas of the body. The twist stance is a favorite for the snake. This stance coils the body storing the potential energy to unwind and strike. 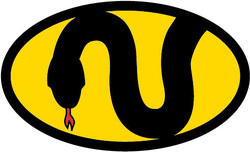 In general, the snake is often settled low to the earth, and at times may be entwined with his attacker on the ground. The extended fingers are the weapon of choice for the viper snake. The middle knuckle fist, forefinger fist, the ball of the foot, and heel of the foot can also serve the serpent's needs for precision striking to vital points. The constrictor will utilize his entire body to contact and control his foe. The forearm can be a particularly foreboding tool as it slides into position seizing the throat and collapsing the airway. Ropes, chains, and nets are ideal for the pinning desires of the constrictor. The viper will utilize throwing knifes, throwing stars, and darts to achieve his need for pin pointed focus.